One of the things I enjoyed doing the most with Amanda was running. We were those crazy people that ran for FUN. I still enjoy it as a way to clear my head. 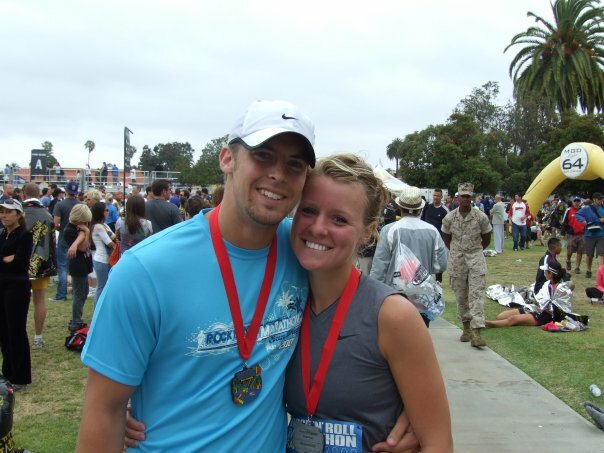 Shortly after we got married we trained for and ran a marathon in San Diego. During that season I fell more in love with my wife that I ever thought I could. She was tenacious and gritty when she trained. She met every challenge head-on, full of courage and determined to finish. I always loved running her pace. I could have run faster if I pushed myself, but something about her pace was comfortable and familiar. As if it was the way my legs were designed to run. We enjoyed running that pace together because we could carry on conversation. We were never too out of breath. More of our friendship was forged in those runs than in any other setting. We could go out for an hour, run, and talk about life, frustrations, hopes and dreams. She hardly ever wavered from her pace. She would hit 9 minute mile splits on long runs every mile for 10 miles or so. No fluctuation. Steady. That’s how she operated life. If there were two words that defined Amanda they were “Wisdom” and “Balance.” Over and over in her journal she prayed that should would be “steadfast and immovable." She loved life to be balanced. I’m the complete opposite. I’m the kind of guy that will run mach 6 until my hair is on fire and everything (and everyone) around me is burning down. I’ll go, go, go and then crash. She was always steady and consistent. She taught me the value of running at a slower pace of life in order to enjoy a better quality of relationships. However, in every training run we would get down to the last mile or two and she would turn to me and say, “Babe, if you feel good run on up ahead. Finish strong at your own pace.” Sometimes I’d stay with her because I was enjoying our run so much. But most of the time I’d take her up on it. I’d kick it into another gear and run the last mile or two at a 7 or 7.5 minute mile or so. I feel like this is a metaphor for my life now. When Amanda stepped into eternity she crossed the finish line and heard her Heavenly Father say, “You’ve fought the good fight, you’ve finished the race. Well done.” But I can hear her soft voice ringing in my ear, “Babe, if you feel good run on up ahead . . . Serve more people. Help more people. Build Jesus’ church. Make something of this. Don’t waste it . . . Finish strong at your own pace." Now, I’m trying to do what 90% of pastors don’t do - Finish strong and Finish well. I’m trying to figure out how to pick up the pace and serve as many people as I can. One day I’ll cross the finish line and meet Amanda in the finisher’s circle. And maybe, just maybe, we’ll get to go on another one of those long runs together, this time along the shores of Heaven.